WA’s mining boom is raking in the money for the state government. 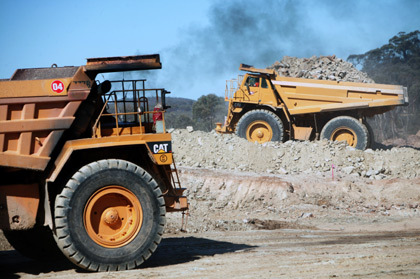 Western Australia’s burgeoning mining royalties have continued to strengthen the state’s economy, with the government sector recording a $1.1 billion surplus for the first half of the financial year. The operating surplus of $1.1 billion for the first six months of 2010/11 is a huge turnaround from the $259 million operating deficit for the first half of 2009/10. Treasurer Christian Porter said the WA Quarterly Financial Results report showed the state reaped nearly $12.3 billion worth of revenue for the first half of 2010/11. That is up by $2.1 billion on the same period last financial year. “The main driver of this increase was a rise of $964 million in mining royalties, partly due to the state government’s successful negotiations to remove the royalty concession on iron ore production,” Mr Porter said. Increased taxes added an extra $509 million to revenue as well as the one-off payment of $350 million by BHP Billiton and Rio Tinto resulting from changes to the State Agreement Acts. The report revealed that the property and retail sectors remained subdued in the first half of 2010/11, resulting in lower stamp and other transfer duties, which were down $89 million. General government sector expenditure was also up $761 million, blowing out by 7.3 per cent because of higher grants spending and the government’s one-off payroll tax rebate. However, Mr Porter said the December result showed that public sector salaries grew by only 4.9 per cent and reflected the government’s effort to rein in spending. Public sector net debt also rose by $446 million in the first six months of 2010/11, in line with planned spending on major infrastructure. Spending on public infrastructure was up $338 million from the same period in 2009/10 due to construction on the Southern Seawater desalination plant, Fiona Stanley Hospital and other health infrastructure projects.